It’s impossible to separate Warner Bros.’ latest DC animated movie from the fact that it features Adam West in his final outing as Batman. West’s tragic death just four months ago saddened fans everywhere. And while the movie can most certainly stand on its own, beyond serving as a fitting tribute, it excels in bringing us the ‘60s Batman at his very best. 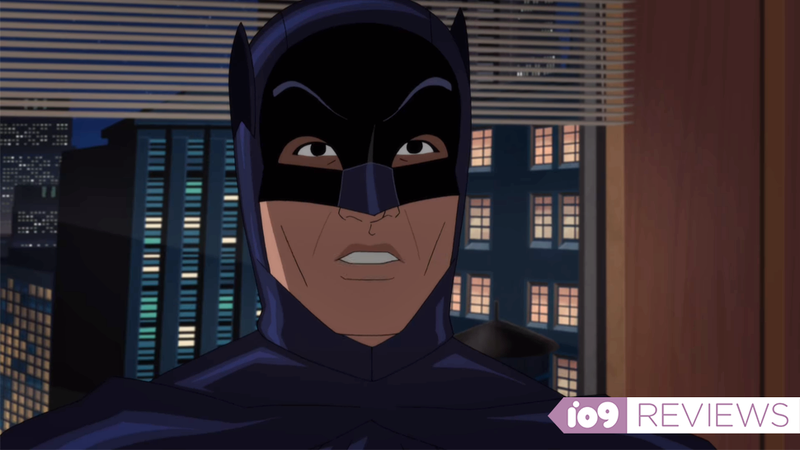 The first 1960s Batman animated movie, last year’s Return of the Caped Crusaders, was the first continuation of a TV superhero classic. It delivered on extremely high expectations, offering up a deceptively charming thesis on the light and dark of decades of Batman interpretations. Batman vs. Two-Face doesn’t really have to rely on the indulgence of letting you know how much it loves the glorious camp of the 1966 series. It’s considerably less zany for the sake of zaniness (although that is simply by its own standards, this is still a movie that’s as mad as a hatter). Instead of relying on bringing back oodles and oodles of familiar faces, it’s content to tell a much more manageable story: one that, just like the Batman ‘66 comics, lovingly enriches this version of Gotham with new takes on characters the show never got round to adapting. As you might have guessed from the title, the character brought to 1966 this time around is Harvey Dent, the Gotham DA turned maddened criminal villain whose mood can turn with the flip of a coin, and played to perfection William Shatner. Shatner doesn’t, as you might expect, give a wildly over-the-top performance; he’s surprisingly nuanced one as both sides of Harvey. That said, this movie does include an excellently silly conversation where Shatner has a spirited conversation with himself in his two Harvey voices. Alongside a suitably Batman ‘66 re-imagining of Dent’s origin story that involves Hugo Strange and a suitably-labled “Evil Extractor,” Shatner’s Harvey sits at the core of Batman vs. Two-Face. The film delves into the fear a supposedly-cured Dent feels that his darker impulses could rise up again (spoilers: of course they do, or this movie wouldn’t happen). Although there are a few distractions along the way—in the form of delightful yet brief stints with two classic Batman ‘66 villains, Victor Buono’s King Tut (now voiced by Wally Wingert) and Roddy McDowall’s Bookworm (Jeff Bergman)—Harvey’s plight and his re-emergence as Two-Face serve as the emotional backbone of the film. Shatner’s performance matches an equally measured and nuanced once from West, both as Batman and as Bruce Wayne struggling to be there for his ailing friend. And while yes, West is still best as that endearing straight edge to the inherent absurdity of the world of Batman ‘66, the quieter moments of this movie paint a fuller picture of his Batman, and are made heart-wrenching in the context of his passing. But while more subdued than its predecessor, and more focused on the expansion beyond the typical sort of stories that made Batman ‘66 a beloved icon, that’s not to say that Batman vs. Two-Face is an entirely too self-serious film. It is still keenly aware of its kitschy trappings, and is just as capable of reveling in the theatrics of, say, a sequence where Batman and Robin are chased through a giant pool table, or dumb gags like Harvey wanting Bruce to supper a charity for “Underprivileged Fraternal Twins.” (“The stigma of being the less attractive twin is a burden nobody should have to bear,” West adds, in an earnest delivery so perfectly deadpan it might just be the best line of the movie). This time around, the ethos of Batman ‘66 gets displayed through brief cameos and a sense of style, rather than throwing as much as it can on the table. Like Return of the Caped Crusaders before it, Batman vs. Two-Face deeply loves and respects what the decades-old TV adaptation did for the world’s greatest detective. And really, that’s what makes Batman vs. Two-Face such a strong film, and a sad one with the context of West’s death. It’s silly enough to embrace the camp hysteria of Batman ‘66, while also lovingly aware that leaning on wackiness shouldn’t be an excuse to get away with weightless storytelling. Through the excellent performances of Shatner and West—that, frankly, belie their ages in a way neither Julie Newmar or Burt Ward’s performances as Catwoman and Robin ever quite can—Batman vs. Two-Face gains a great heart to match its goofier aspects, with the two coming together to make for a thoroughly enjoyable 70 minutes. This week, Burt Ward told press that if Batman vs. Two-Face goes down well, we could get more movies in the Batman ‘66 universe. But as much as it pains me to say it, I’d be happy closing the door on this wonderfully bold and bright-eyed take on Gotham City for good with Batman vs. Two-Face. 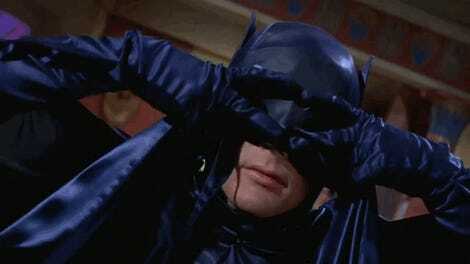 It stands as the finest parting gift you could give Adam West’s Batman: it’s not a greatest hits collection of his finest moments, but instead one final, excellent story that shows us not just the endless appeal of Batman ‘66's world, but why West’s absence leaves such a monumental gap in the Bat-Pantheon in his place. Batman vs. Two-Face is available digitally now, and on blu-ray and DVD October 17.